Methapyrilene Hydrochloride Overdose is the accidental or intentional intake of the drug in dosage higher than prescribed values. What is Methapyrilene Hydrochloride Overdose? What are the Causes of Methapyrilene Hydrochloride Overdose? What are the Signs and Symptoms of Methapyrilene Hydrochloride Overdose? The signs and symptoms of Methapyrilene Hydrochloride Overdose can vary from one individual to another. It may be mild in some and severe in others. Several systems of the body, such as the nervous system, vascular system, urinary system, the skin and ENT may be affected. How is First Aid administered for Methapyrilene Hydrochloride Overdose? Who should administer First Aid for Methapyrilene Hydrochloride Overdose? 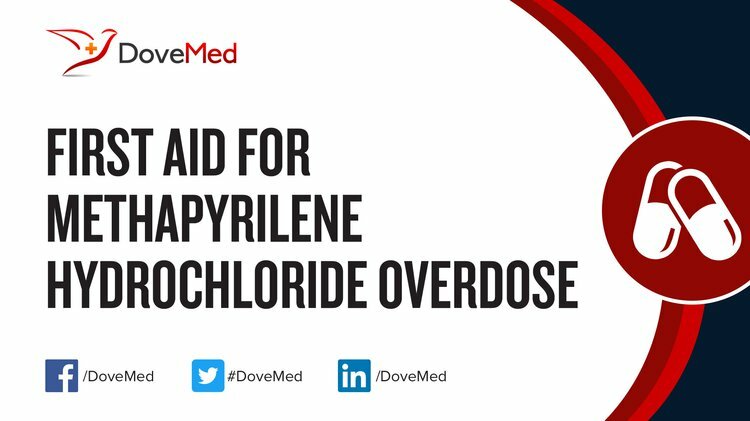 First aid for Methapyrilene Hydrochloride Overdose is administered by healthcare professionals. What is the Prognosis of Methapyrilene Hydrochloride Overdose? How can Methapyrilene Hydrochloride Overdose be Prevented? Peppas, N. A., Ekerdt, B., & Gomez-Burgaz, M. (2014). U.S. Patent No. 8,821,899. Washington, DC: U.S. Patent and Trademark Office. Srinivasan, V., Brown, R., Brown, D., Menendez, J. C., Balasubramanian, V., & Suphasawud, S. P. (2016). U.S. Patent No. 9,492,541. Washington, DC: U.S. Patent and Trademark Office. Khalil, M. M., Issab, Y. M., & Mostafaa, S. M. A Novel Coated Graphite Electrode for Potentiometric Determination of Pyrilamine Maleate in Pharmaceutical Compounds and Biological Fluids. Sahini, N., Selvaraj, S., & Borlak, J. (2014). Whole genome transcript profiling of drug induced steatosis in rats reveals a gene signature predictive of outcome. PloS one, 9(12), e114085. Allen, L., & Ansel, H. C. (2013). Ansel's pharmaceutical dosage forms and drug delivery systems. Lippincott Williams & Wilkins. Dixit, S., Menendez, J. C., & Brown, R. (2016). U.S. Patent Application No. 15/171,231. Verstraelen, S., Peers, B., Maho, W., Hollanders, K., Remy, S., Berckmans, P., ... & Witters, H. (2016). Phenotypic and biomarker evaluation of zebrafish larvae as an alternative model to predict mammalian hepatotoxicity. Journal of Applied Toxicology, 36(9), 1194-1206. Gooderham, N. J., & Koufaris, C. (2014). Using microRNA profiles to predict and evaluate hepatic carcinogenic potential. Toxicology letters, 228(2), 127-132.